Apologies for the less-than-appetizing shot of the food. After I served this at my party last December 15, Genie has been asking me to post the recipe already, but I couldn't take a picture at that moment as it was night. So I took a picture of leftovers. Naturally, even with some styling, you cannot remedy the disarray after you've crammed it into a microwaveable container. Another thing I have to apologize for is the fact that I haven't posted in a while. Have I burned out? I assure you not. But you know that feeling people get when they've only been driving for a few weeks and they either run over a puppy or nail someone's side mirror? That's sort of what cooking (and especially making desserts) has been like for me for the past few weeks. You see, when I graduated from medical school and started studying, I gained 4 pounds in 6 months (May to October). I was thinking that it was natural to gain a little weight when you're studying and stressed out, but since I went to Boracay and ate all the Christmas crap that people have been giving us, I gained an additional 5 pounds in 2 months. Fuuuuuuuuuuuuuuuuuuck. I appreciate all the food gifts given to our family and they taste great and all, but I really don't want another dessert gift. Not only does it inhibit kitchen creativity, but I am usually the one pressured to finish them, hence the weight gain. So: no more finishing other people's food. I am eating half my usual portions. I am running 30 minutes a day. No more desserts I didn't make myself. Maybe I can work my way to an even lighter weight than before med school! Wishful thinking. Well, if ever I am, this fresh, vegetable-and-fiber-rich, low-fat pasta should help me along. This recipe is adapted from Bon Appetit (May 2005). 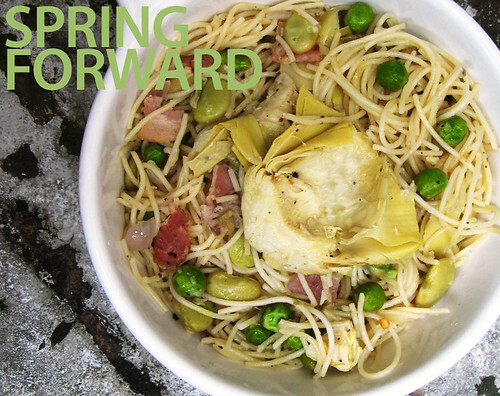 This pasta has great spring flavors, very fresh and light. I only wish I had better-quality beans and my friends came, uh, on time. The beans were weirdly starchy and of course, the pasta was not cooked exactly the way I wanted since it had to be reheated. Grr. Substitute fresh ingredients where you can. Thinly slice artichoke hearts crosswise. Heat oil in an extra-large skillet over medium heat. Add the onions and bacon. Sauté until the onions are soft and the bacon crisps slightly. Stir in the crushed red pepper. Add the sliced artichokes and wine. Allow to reduce for 2 minutes. Add the fava beans, peas, and 1/2 cup water. Cover, reduce the heat to medium-low, and simmer until the vegetables are tender, about 10 minutes. Cook the pasta in a large pot of rapidly boiling salted water until tender but still firm to bite. Drain and transfer to a large bowl. Stir in the vegetable mixture and pecorino romano; toss to blend. Season to taste with salt and pepper. Serve with additional cheese on the side.